One million helmet stickers for that. Desmond Howard, recipient of the 1991 Heisman Trophy award, should be regarded by all Michigan fans as one of the greatest ever to put on the winged-helmet. Over the weekend Desmond was enshrined into the College Football Hall of Fame, ironically, in South Bend, IN. Nice write up by AnnArbor.com's Kyle Meinke. I say "ironically", because one of his greatest highlights took place against the Irish the same year he won the Heisman. Whatever great catches I'll see for the rest of my life, there will only be one that I consider, "The Catch". Now that Desmond's place in college football history is firmly intact, it is finally time for the University of Michigan to step up and follow suit. 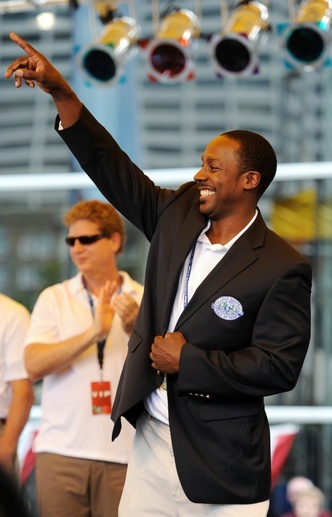 This year (say September 10th perhaps) would be an ideal time for Michigan to formally and with tremendous fanfare, retire the number of Desmond Howard. Ace from The Wolverine Blog, who shares a nice personal story of #21, points out Desmond's quote from his press teleconference last Thursday when the question about retiring his number came up. Now don't get me wrong, I love Desmond, but a statue might be a bit much. However, retiring his number is the least Michigan can do. And I feel the time is right for such an announcement. A total of five numbers have been retired throughout the storied history of Michigan football, honoring seven players. Six of players honored were linemen, and all were two-way players. Three brothers...Francis, Albert and Alvin Wistert all wore #11. Bennie Oosterbaan wore #47. President Gerald Ford wore #48. Ron Kramer wore #87. And the great Tom Harmon adorned #98. To date, no African-American has had their number retired at Michigan. Greg Dooley from MVictors asked Dave Brandon the question during the uniform unveiling last month, with all of the other things planned for the night game against Notre Dame on September 10th, if a jersey retirement of #21 was being considered for the night's festivities. Brandon answered quite truthfully that any such announcement involving an event of such significant proportions as a jersey retirement would most certainly have it's own press event, and would not be wrapped into the legacy jersey unveiling. I do not second-guess Greg asking the question. It should have been asked. And I think DB answered it the best way he could. But my take on that exchange was that the fans are thinking about it, and now the university should be thinking about it, if they weren't already. It is time. Do the right thing and retire #21.